"All a sceptic is is someone who hasn't yet been haunted by a ghost. " In recent years, many stories have started to circulate about haunted schools within the United States as well as many other locations worldwide. There are many real life ghost stories, stories of ghost encounters, and other ghostly legends that surround certain educational facilities and the school spirits that are said to haunt them. In some instances, it is believed that the souls of students roam the grounds of such buildings. In other instances, it is the souls of the professors and teachers shuffling between the spiritual realm and the physical plane. It is not at all unusual for strange paranormal phenomenon to occur in these locations. This is why Greatest Unsolved Mysteries feels that it is appropriate to have a specific section dedicated to these special hauntings. If you have an interest in school spirits, you are sure to enjoy the information contained within this website. Apparitions, disembodied voices, ghost sounds, and even ghost voices have been witnessed at several different schools worldwide. Strange events, unusual smells, and odd feelings are often experienced by many that visit, attend, and/or work at various types of schools. Many of the haunted schools around the world are nothing more than lone, abandoned buildings while others are schools with a high level of students. Many haunted schools once served as hospitals, prisons, and other buildings that have harbored a high level of emotions and tragic events. There are many reasons why an educational facility may be haunted. Throughout these pages, you will be introduced to a large number of school spirits and may even learn the stories associated with them if those stories are available. If you are interested in obtaining a higher education in ghost hunting and the paranormal, you are sure to discover many interesting ghost facts and historical facts throughout this section of Greatest Unsolved Mysteries. While many of the ghostly stories surrounding schools around the world are nothing more than urban legends and scary tales passed on from one student to another, there seems to be some sort of validity surrounding many of the real ghost stories about school spirits in circulation today about some of these educational facilities. Throughout this section, you will learn about the stories of ghost encounters and other events that transpired in educational facilities based on eyewitness accounts, historical notations, and stories shared from one generation to another. If you have an interest in school spirits or haunted Florida in general, it is likely that you will enjoy this guide on Flagler College St. Augustine. There are many mysterious stories, legends, and other tales that surround this large and immensely popular college in Gainesville, Florida. 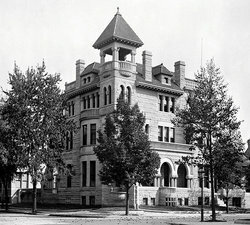 The St. Mary’s haunted college got the reputation that it has today because of one major conflict that occurred between two individuals. According to the stories and witness accounts associated with the rumors there are several school spirits at Moorhood High School in the State of Minnesota. Individuals that have visited the haunted school claim that it is one of the most haunted places in New Jersey.